Ideal for use with notebooks and other systems with a 9-pin Firewire 800 port.. 100% compatible with iLink(r); Apple Firewire(r) and other IEEE-1394 peripherals. 6-pin female to 9-pin male. Type FireWire(tm) 800 Adapter. Not for use with bus powered Firewire peripherals. Ideal for use with notebooks and other systems with a 4-pin Firewire port.. 100% compatible with iLink(r); Apple Firewire(r) and other IEEE-1394 peripherals. 6-pin female to 4-pin male. Type Adapter. Not for use with bus powered Firewire peripherals. Ideal for use with notebooks and other systems with a Firewire port.. 100% compatible with iLink(r); Apple Firewire(r) and other IEEE-1394 peripherals. 4-pin female to 6-pin male. Type Adapter. Not for use with bus powered Firewire peripherals. Ideal for use with notebooks and other systems with a 6-pin Firewire port.. 100% compatible with iLink(r); Apple Firewire(r) and other IEEE-1394 peripherals. 6-pin female to 6-pin female. Type Adapter. Not for use with bus powered Firewire peripherals. This Firewire Adapter provides you with the quality you need to achieve high-speed performance you expect from your IEEE-1394 devices. Designed to be 100% compatible with Apple Firewire iLink; and all other IEEE-1394 peripherals. 6-pin male to 4-pin male. Not for use with bus powered Firewire peripherals. This Firewire Adapter provides you with the quality you need to achieve high-speed performance you expect from your IEEE-1394 devices. Designed to be 100% compatible with IEEE-1394 peripherals. The FireWire gender changers let you connect two FireWire cables together. You can use it to extend your FireWire cable further. These gender changers can be used for notebooks and other devices. Each of the products are designed to provide high speed performance and is applicable for lifetime guarantee. 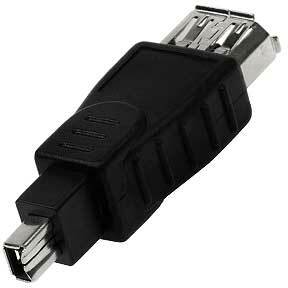 You can choose from 4-pin, 6-pin, 9-pin Fire Wires to varied combinations of male/female adapters. You can use them for duplex multimode, FireWire, and USB connections.